Introduction: There are a lot of tackle boxes out there, and while some tackle solutions aim to do it all, the Tackle-Rack LMS is designed for one main reason...to keep your lures within easy reach, and snag free at all times. This trouble-free tackle solution brings a innovative patented design to anglers that utilize a wide assortment of lures. Size 17" x 12" x 10"
Impressions: When I first set eyes on the Tackle-Rack my first thought was that it looked very similar to a conventional tool box, but upon closer examination it was apparent that this box was indeed designed for anglers. While straightforward in design the Tackle-Rack addresses the age old problem of keeping lures organized, easier to locate, and tangle free. How many times have you gone to grab that perfect crankbait only to find it tangled among a sea of treble hooks from your other lures? In a tournament situation this not only is frustrating, but can cost you valuable time. 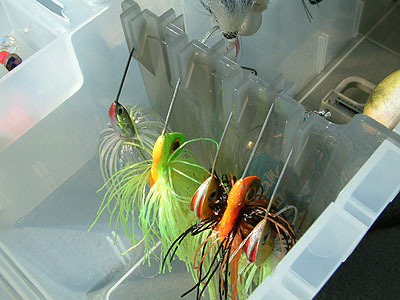 The Tackle-Rack is more then just a polypropylene box, it is actually a cleverly designed tackle solution. Materials/Durability: The Tackle-Rack is made out of extremely thick polypropylene that is both scratch and impact resistant. Sharp hooks barely scuff the surface of the box, and an impact from a hammer did almost no harm to the box at all. Polypropylene is a medium-soft material that will not shatter, or easily dry out and become brittle from contact with direct sunlight. When we dropped the box from a 6 foot height the lid popped off a couple times, but there was absolutely no damage to the structural integrity of the Tackle-Rack. This a tough box that can really take a pounding to protect your valuable collection of lures. Design: The Tackle-Rack would be considered a large tackle box with a overall length of 17 inches. One of the reasons for the large design is to allow easy identification of lures and quick access to all of them. The box is designed with four adjustable hanging dividers. These dividers can come out of the box with ease, and can be positioned in various areas of the box. 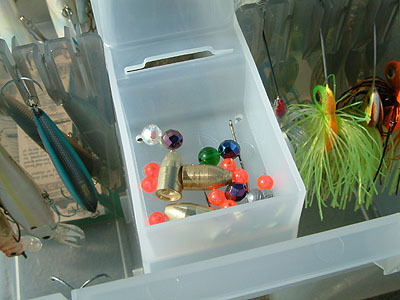 (More about lure management system below) The lid can either be opened one half at a time, or entire lid can come right off the top Tackle-Rack and snap on the bottom of the box to provide added base support. We found that once the lid was on the underside of the box the Tackle-Rack held snug to the marine carpet of our bass boat even with good sized swells coming in contact with the vessel. 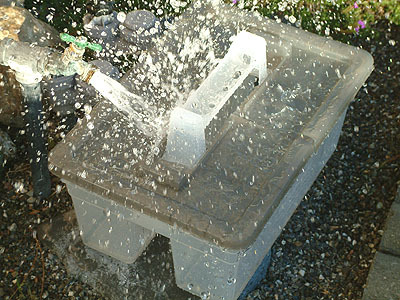 During our water resistance tests we noticed that when splashed with water the box was not able to hold much of it out, and the water began to well up inside the base of the box. 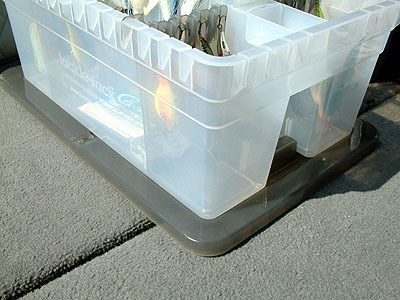 To manage water buildup the Tackle-Rack has a pop-out drainage hole in each corner of the box. Once these holes were punched the box drained quickly, and with the lid removed the top the moisture evaporates quickly. This is important because it allows your lures to dry quickly, preventing any of your terminal tackle from rusting. Tackle Rack Lure Management System: "LMS" stands for "Lure Management System." This system consists of a completely open design with patented "Hook-Nook" notches all over the box. These notches allow anglers to vertically hang everything including cranks, spinners, and jigs. Hanging lures enables anglers to quickly identify and remove lures quickly. 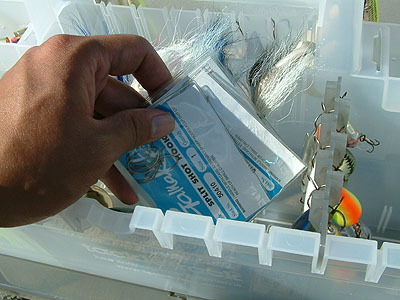 They can be organized into sections so that anglers waste no time making speedy lure changes. Hanging lures also makes it so that the hooks are all turned safely inward. This configuration also allows lures to be spaced apart so they do not become tangled with one another. One of the greatest innovations that the Tackle Rack LMS has to offer is a very functional handle. Pliers can be stored vertically in the top so that they are always just a grasp away. In addition this is a great spot for small tools, bobbers, knives, and even a light. Configuring: Setting up the Tackle-Rack is extremely easy. All it takes is positioning four hanging dividers in your desired location, then organizing and hanging all your lures. We recommend breaking your lures up by style and application. 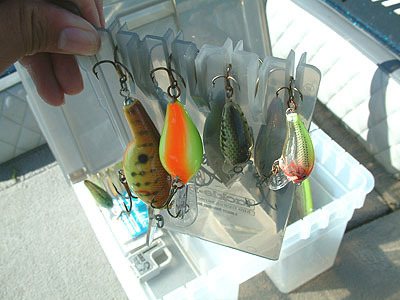 For example, we put all of our crankbaits in one hanger and our spinners another. This allows you to pull out an entire hanger to quickly select among a number of lures. Plastics can rest in the bottom or side of the box. The Tackle-Rack contains no elements in its construction that will react with plasticizers found in many plastic baits, so there is no dye-through. Total Storage Capacity: The Tackle-Rack can retain between 50-70 lures, depending on size and spacing. 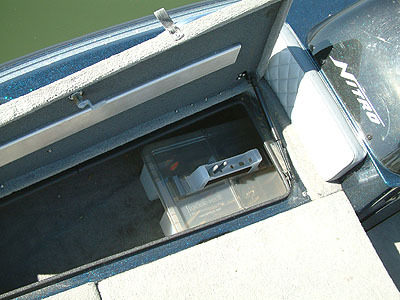 In addition the Tackle-Rack has two small compartments to hold your smaller terminal tackle. We found that you can also store bags of plastics and tools like scales and weights at the base of the box. This is a great box for lures, but not as good for bait fishermen or anglers that have a wide assortment of terminal tackle as the box really is designed for a variety of lures, and has limited space for the division of smaller tackle. Cleaning: As you might expect this is probably the easiest box there is when it comes down to cleaning. Remove the contents and you can spray the box with water and wash all components with light soap. Saltwater anglers will appreciate the ease of maintenance, as there are no parts of this box that will become corroded with saltwater. Even the hinges on the door are made from the same durable polypropylene as the main shell. 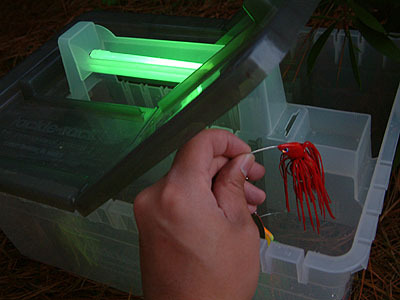 Fishing at Night: As we mentioned earlier the handle of the Tackle-Rack is ideal for a light. Tackle-Rack designed the handle to easily accommodate either a six inch fluorescent light or a glow-stick. This option allows anglers on both the boat and shore to easily identify tackle in the dark. Since the handle holds the light in a concave design the light is held low to the box, lighting up the entire rack's contents. We tested both a fluorescent light and a glow stick and found the light to be much more effective at lighting up all the contents of the box. This integrated light holder-handle essentially frees up a hand for anglers to tie on their lures, and keep fishing long after the sun goes down. Applications: The Tackle-Rack was designed to hold and organize lures, and does a great job at this. The anglers that will benefit most from this tackle system are watercraft, shore lure-fisherman, and tournament anglers. When quick identification and easy access are key demands of your tackle system then the Tackle-Rack truly delivers. 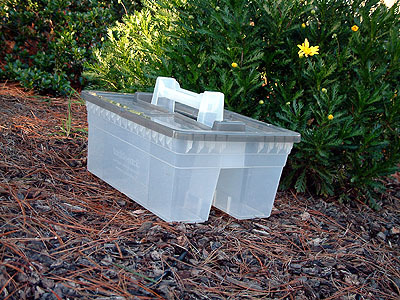 Bait fisherman on the other hand may find the box too limiting in small storage capacity. Also anglers that hike to fishing locations will not benefit from this box since it can only be hand carried in an upright position. During our tests when the box was tilted it had no problems, but if turned upside down many smaller lures would become displaced. Conclusion: The Tackle-Rack LMS is more a "tackle system" rather then just another box. Anglers that enjoy fishing lures will relish the speed and ease in which you can locate and tie on the right lure. Tournament bass anglers with boats will definitely benefit from the Tackle-Rack's organization and open design. While not for everyone, this box will appeal to anyone that is looking for a better way to organize, protect, and handle lures. If these are important factors for your tackle box then the solid construction and innovative design the Tackle-Rack might just be the solution you are looking for.